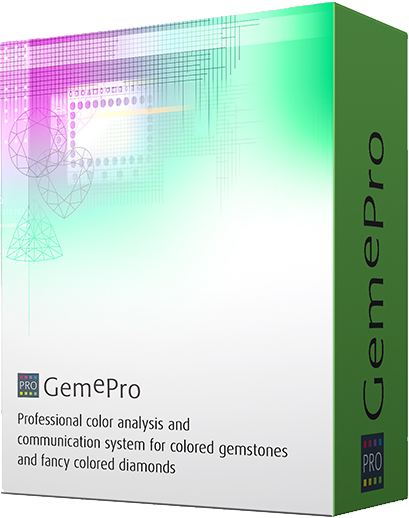 GemePro™ is a professional color analysis and communication system for colored gemstones and fancy colored diamonds that was created for users who require a detailed color breakdown of their gem. The user can precisely analyze, define and communicate the color of a gem. GemePro™ includes the Sampler, which analyzes the digital images of a gem in 2,500 - 10,000 subsections, defining for each its specific hue and corresponding RGB (red/green/blue) proportions. The sampler then determines the gem's average and dominant Gemewizard colors. GemePro™ also includes an audit trail function that enables user to keep records and traces of previous analysis processes. Need professional color communication tool? The benefits of using the GemePro™ begin from ordering supplies and continue throughout the sales cycle. No more color misunderstanding and expensive returns when ordering gemstones and fancy colored diamonds from suppliers. Catalog stock by color and match the requirements of each and every customer. Use color matching to offer supplementary products to customers and increase sales. Take orders for specific colors even if they are not in stock. Use the Sampler to define the color of a gem by its digital image. Produce consistent and documented stone & jewelry appraisals for customers and for insurance purposes. The color database includes 31 hues, each divided into 5 sub-hues. Each sub-hue is expanded by 7 different tone grades and by 9 saturation levels, bringing this to a total of almost 9000 colors. This is indeed the most comprehensive gem color set available and the highest color resolution in the industry. In addition, GemePro™ includes a fancy colored diamonds module with 27 hues, each divided into 5 sub-hues. Each sub-hue is expanded by 7 different tone grades and by 9 saturation levels, bringing this to a total of more than 7000 diamond colors, with their fancy grades. Colors are realistically displayed in the 17 most common cutting styles and shapes. The Sampler analyzes uploaded images of gems or jewelry and provides a color composite of the overall image in 2,500 to 10,000 subsections, creating in effect the image's "Color DNA". The specific hue, together with the corresponding RGB proportions, is defined for each subsection, and then aggregated to retrieve the overall color dispersion. The Sampler returns the Average color of the whole image together with the dominant colors it encountered within. An internal email feature enables the user to communicate the gem's color with 3rd parties. The user can upload the gem's image into the email together with the gem's Gemewizard color image and send them to their customers and/or suppliers. 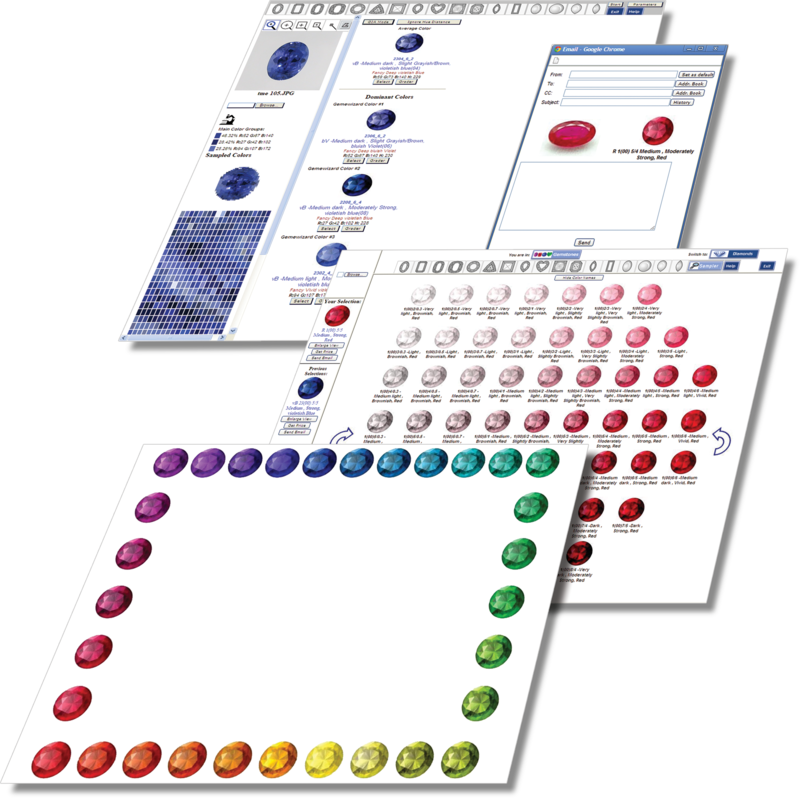 This ensures that the exact gem's color is communicated between parties, without any significance as to the quality of the actual gem's image, even when the other parties do not have the GemePro™ software. The software is available in 3 modes - online, local and server. The Online version enables access to GemePro™ anytime, anywhere, enabling users to analyze their gems wherever they are. The Local install version is intended for a single computer, where all the work is performed locally, without the need of an Internet connection. The Server version is intended for an office environment where multiple users share a common reports database. Reports and Audit Trail In the local and server versions, the user is able to create reports on the analyzed gems and save them. The reports can be sent over the email to 3rd parties. GemePro™ is fully integrated with Quantum Leap PAS appraisal software.